Sealed front panel components give these switches complete protection against dust and prolonged spray and submersion. Switches are vibration, shock, moisture and salt spray resistant. Base is made of durable polyester while actuator is of a polycarbonate material. 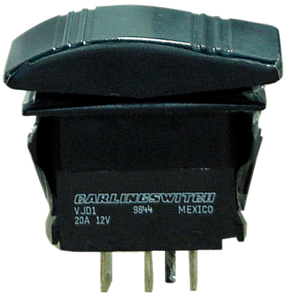 Rated 20A @ 12V, 15A @ 125VAC and 10A @ 250VAC. Requires .830"W x 1.45"L.